In love with the Duck Dynasty series with the Robertson family? They have teamed up with Kershaw to make a full line of knives with their famous Duck Commander logo. The Tickfaw7418DCX features one of the family member's face on the package and a picture of entire family on the back side of package. 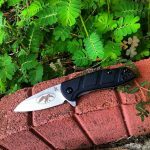 This is a folding knife with the Duck Commander logo engraved on this 2.25 inch blade. It has a bead-blast finish on the blade and a glass-filled nylon black handle. It opens manually and is closed by the liner lock within the handle. Have a piece of the Dynasty, with this knife!